Because of my childhood love of meteorology, I developed a “pen pal” relationship germane to the field: it was with Percy Saltzman. He was a TV weatherman, working for the CBC for many years, and later in life at Global. 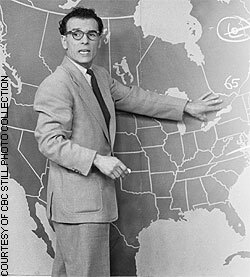 Even in the early days of computer forecast models, Percy still used a chalkboard with a map of the country, and big, thick pieces of chalk to draw cold fronts and warm fronts and to put temperatures on the board for various communities. I think I might still have a few satellite photographs that he sent me when I was in about Grade 8. I learned a lot from him. We will have weather, whether or not. Irrespective of the weather, though, Percy Saltzman’s sage wisdom holds true: no matter what it’s like, there will be weather. On that we can rely! If there were no weather, it would be like living on the moon: we’d have no real atmosphere to speak of, and life would not be sustainable. As long as there is life, there will be weather. God is like that. (You were wondering when God would show up here, weren’t you?) We can’t predict what God will do, but we can be certain of his presence. And without God’s presence, there could be no life. As the apostle Paul said to the council in Athens, “He is the God who made the world and everything in it. Since he is Lord of heaven and earth, he doesn’t live in man-made temples, and human hands can’t serve his needs—for he has no needs. He himself gives life and breath to everything, and he satisfies every need. From one man he created all the nations throughout the whole earth. He decided beforehand when they should rise and fall, and he determined their boundaries. “His purpose was for the nations to seek after God and perhaps feel their way toward him and find him—though he is not far from any one of us. For in him we live and move and exist. As some of your own poets have said, ‘We are his offspring.’ And since this is true, we shouldn’t think of God as an idol designed by craftsmen from gold or silver or stone” (Acts 17.24-29, NLT). God is not predictable, but he is always present. Or, as C.S. Lewis wrote of Aslan, the Christ-figure in his writings, he is not safe, but he is good. We will always have weather, whether we like it or not (and I think we have liked it this week, mostly); and we will always have God. Will we embrace him, and walk with him in faith?